New arrival full lace wig in #613 blonde color, in body wave hair texture. 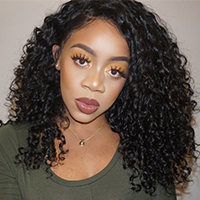 This wig is made with human hair and has a lot of length options. 100% human hair is sewn into the lace base, the wig has full lace around the unit, you can cut before wear it. You can wear the wig in anyway you like, ponytails or up-dos.